It's easy to write a lot about a band that is bad, or a band that has lots of ups and downs, but for the acts that are solid throughout, unless you listen to the album repeatedly - enough to fully digest it's complexities - then it is damn difficult to make a decent article about it. Barn Burner is one of those acts. 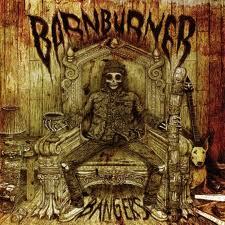 Their debut (I believe) album, Bangers, is a solid rendition of rockin' and groovin' stoner metal. They play the blues-tinged, funk-riddled style of the genre which is my favorite. Every song - while great - sounds similar to the one previous and the one after, there is no way to pick the stand-outs, no song falls behind either, all are of the same caliber, all of them rock! The album as a whole isn't amazing, it doesn't break any new ground or make you scratch your head in bemusement, but if you like one song, then you're going to like them all, and sometimes that's what you need. Not every band needs to be fresh and outstanding, a breath of fresh air or a revitalizement to a stale genre. Sometimes you just want to hear some music you like, with no worry about ups and downs, or surprises. Barn Burner is that kind of band. Maybe for their next album, they will try to forage new ground, to strive in a new direction, but if they don't, I am honestly ok with that. Like the power metal greats, Manowar, they can release the same music (more or less) year after year, and I would still become excited listen with fevered anticipation. A solid display of stoner, you'll take away nothing more.